Where to begin? So much going on during retirement. On the forums, there was a couple talking about being interested in checking out Costa Rica as a place of residence. Next thing you know, they mention that they're interested in knives and guns. That works for me! We invited them to visit us in Atenas. Eventually several communications led to them coming to Atenas and staying in our Casita for a few days. We had them legally "mule" in a few things we needed, which they kindly did, and we developed a friendship. There is a high probability that they will be leaving the USA and coming back to this area to live. They were very impressed with Costa Rica. Although it was a LOT of work for Pat, I'm pretty sure a good time was had by all. There's a zoo on the old highway from Alajuela to Atenas which always struck me as a typical tourist trap -- big gaudy signs; high entrance fee; fences to keep anyone from seeing what's inside, etc. So, I've never been there before. Since one of our visitors is a nature photographer, we thought that the Zoo Ave might be a good bet for them ... and us. Wow! Did I misunderstand that place. Zoo Ave is the most natural wildlife sanctuary that I've ever seen. They shouldn't call it a "zoo" because North Americans and Europeans will envision a plethora of cages filled with scroungy looking critters. This is the polar opposite. First, they've recreated the rainforest, right there in the bustling city of Alajuela. Then, it is a shock that many of the critters are just loose, flying and running around in their natural environment. Only the raptors, rare or delicate birds and the dangerous things like crocodiles are confined -- but even these confinements are very cleverly constructed so that there is little sense of "a cage." On top of that, the Zoo Ave is a major player in breeding and reintroducing endangered birds into the wild. Additionally, they are a rescue organization for exotic rainforest fauna that have suffered through being "pets" and are abused or abandoned. Wow. Totally and highly recommended. This place is now on our list of "must sees" for all visitors. The local organic coffee plantation is called El Toledo. Organic. There's so much horse crap in the market about organic this and organic that. It is typically a turn-off for me because it is so often a B.S. way of getting the sheeple to pay extra for crappy-quality food. It's a big scam. So I was NOT very interested in El Toledo. Yeah, their coffee, which we sampled once, was pretty tasty but it was significantly more expensive than the yummy stuff we regularly buy from our Atenas Co-op. We thought that Tracy Gano might get some good rainforest photos and they wanted to see a coffee plantation. Seemed like a good idea for a morning tour before the afternoon rains. 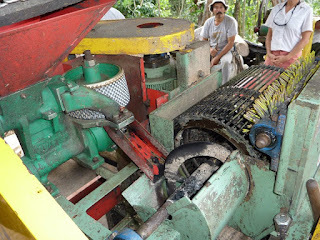 Coffee beans are stripped of fruit and cleaned automatically. El Toledo is the tiny plantation of a 3rd generation family who had an "a-ha!" moment almost a decade ago. They were growing coffee like many of the other 1200 small producers in the Atenas area. State-of-the-art farming methods and liberal employment of the latest high tech chemistry to maximize production and minimize weed and bug losses. Just like everyone else. The problem was that "Dad," the family patriarch, was suffering all kinds of strange weaknesses and sicknesses. Could it be all of the chemicals being poured into the plantation to keep up to the industry standards? Dad and his two sons decided to try a strange new plantation regimen called sustainable organic farming. That involves restoring the soil to its rich, natural state by not clearing away the dead-fall and the natural weeds; creating catchments so that the topsoil and rains are held and allowed to percolate naturally down into the water table; terracing the coffee trees so that they gain a secure footing in the forest; using only natural mammalian fertilizers (manure) added to the soil; and, nurturing nitrogen-fixing legume vegetation throughout the plantation so that there is a natural shade combined with symbiotic soil enrichment. You can SMELL the difference in the soil and forest as you walk the plantation trails. We have regular coffee plantings all around us in Atenas and they are not the same as El Toledo. These people are onto something. The regular coffee operations spend 80% of their costs on chemicals and additives. The El Toledo folks spend 20% for chicken and cow poop. That's all. Their crop yield is only 50% of the big commercial operations but the coffee buyers (and now we) are willing to pay a premium for the super flavor and chemical-free product. Have we slipped over into the wack-o sustainable organic tribe? Maybe. Tour El Toledo and see if you can resist the spiel. Our friends Tim and Meg live here and have made it their life-mission to live "better than well" here in Paradise, on a budget. They are (obviously) experts at finding astoundingly fabulous living quarters in Costa Rica, at unbelievably low prices. These people are funny, interesting, enjoyable and certainly "smarter than the average bears." When we first met these two "magicians," they were living in a luxury condo, at the most exclusive resort on the Costa Rican Pacific Coast. Absolutely a ga-ga lifestyle. Price? Less than a nice apartment in San Jose or any other decent CR city. That was nothing compared to their present digs. The new place is on the Pacific Ocean, but with views also backward into the rainforest. Secluded and private. (We had to traverse almost 10km of forest roadway and pass through 3 different guard gates before we even got into the vicinity of their house.) An ultra-modern glass, wood and steel architectural wonder built into a jungle clearing, overlooking the ocean. Multiple bedrooms and bathrooms. Solar power generation array. Infinity pool. Jacuzzi pool. Gym. Entertainment deck. Gardens. Wild birds and critters the likes of which you'll only see on a National Geographic special. You name it -- this place has it. And, oh yeah, they've rented it for another price that would only get you a tiny apartment in Escazu. How do they do this? And yet ... there aren't two people we'd enjoy being with more than these two. Great folks. Aw, geez. Another pet. A local sharecropper farmer lady came by a couple days ago carrying a good sized turtle. She said that she needed to find him a home because the local dogs kill turtles and this one was obviously a stray, out of his element. What to do? Find him a natural forest home beside some river or stream or bring him into our walled compound where he can live a safe life only harassed by Randy and Gus? Obviously the correct choice would be to find a beautiful little stream in the forest for "Bob." Oh. Did I forget? This guy was immediately named Bob after my last dear departed turtle pet, lost to some Houston vandals many years ago. Anyway, Bob took up residence in the back yard, along the wall covered with vetiver. I dug in a small wading pool for him and stuck some barrier boards into the sod at both sides of the house. Bob's new "cage" is a couple hundred square meters of lawn and garden. Bob has already proven that he can climb over just about any barriers we create so it is probably a matter of time before he beats feet back into the jungle. Update #1 - 29Oct2012: Bob vanished from the backyard Sunday, 28 Oct. He either managed to climb his 8" tall board barrier or someone decided to "borrow" him for awhile. I hope it was the former and he is safely back down to the river hunting. Update #2 - 31Oct2012: Bob didn't really vanish from the backyard. We found him hiding out in the tall Vetiver grass along our property wall on Monday afternoon. He's been out an about hunting bugs (we suspect) and the dogs, Randy & Gus, are starting to ignore him. Randy always runs out to check on him first thing in the morning, but we don't think he will hurt him now. The big earthquake a few weeks ago really was a significant seismic even. Nothing in my California days came even close, and a couple of those (Whittier, Landers, Northridge) were major shakers. Having been quite close to the epicenter of the Landers twin quakes, when our CR big one started I said to Pat, right away, "This is big!" Fortunately, we came through that with only a little broken art glass. Then, 23 October, a smaller quake did some rocking and rolling here. Although it was a lot smaller than the "Big One," the world news services must have been having a slow news day because they headlined the reports with things like, "Major quake strikes Costa Rica." Friends and family were immediately online asking if we were O.K. It's amazing what the news people can do with a word choice like "strikes." Bottom line is that it was nothing. Zero fatalities and no reported damage of import anywhere in the country. Good ol' tropical storm / hurricane Sandy brought us bands of rain for several days. Costa Rica has never been directly hit by a hurricane but when the storms are huge, like this one, we can see lots and lots of rain. (Uh, it's the rainforest, baby.) This one has given us squalls of rain bands through the night (rare) and afternoon (common.) Not a big deal but it is welcome during this rainy season since we've not had as much rain as we wanted. Yeah, I'm a little freaked out about controlling my weight here, in the land of abundance. I've been working up to aerobic level almost every day, doing chores, for the year, plus, that we've been here. I don't think I've ever been in better overall shape (and my tan is to die for.) But, the few off-days and the limitless yummy stuff to eat is not good for anybody's girlish figure. So, now that the heavy physical projects of house construction are winding down, we've started scheduled walking workouts. Soon, we'll start bicycle workouts. Maybe we can find an equilibrium point to balance the eats with the exercise. The past week featured the feast of the patron saint of the City of Atenas, San Rafael. The locals go all out for this fiesta. At 0500 hours every morning the fireworks mortars fire off to announce the start. There were several Catholic masses and many of the public and private businesses shut down. Even in the rain of Hurricane Sandy (see above) the food booths and the arts n' crafts show were in full swing. This went on all week. Church pews were moved out into the street to give the community plenty of seating around the impressed Bingo tables for enjoying the good eats sold by an array of town clubs and restaurants. Auctioneer closes the bidding on a fine steer. Over in the church yard, cattle were being auctioned for Catholic charities around the permanent (!) pens and loading ramps situated inside the parish properties. I could get into big-time trouble in an auction like this since the only Spanish I understood from the auctioneer's mouth was, "I've got (a bid of xxxx colones)," and then a blather of numbers, which could have been 50 cents or 50 million dollars. He was talking too fast for me. No problem. I didn't bid on anything. Then the rains started again. So ... hey ... that's about it from down here in Central America. What's happening in your neck of the woods? Lots of excitement! Glad y'all are enjoying yourselves down there! Miss ya. Thanks, Kat. You really need to make a point to get there within the next month, or so, while they are in the peak of the picking season. This way you can see the whole process from picking to roasting. Well worth it! Toledo will now be on the list for all our future visitors.